Macarios is a 2 bedroom Premier Villa part of a secluded complex of three separate villas all set amidst lush greenery in the southern tip of the Greek Island of Kefalonia, Greece. There is a lovely large terrace area outdoors overlooking the immediate landscape and blue Ionian Sea in the distance. Surrounded by beautiful gardens, the outdoor lounge areas are ideal for sunbathing or simply relaxing whilst sharing a bottle of chilled Robola, one of Kefalonia's most famous wines. The shaded dining area is furnished for al fresco dining and offers breath taking views of the sunset. Next to the swimming pool is an open sky shower to rinse off the sand and salt after a day at the beach. Inside, Macarios has been decorated to a high standard with an overall ethnic feel that blends perfectly with the environment. The use of natural materials together with modern amenities and comfortable furnishings contribute to the sense of ultimate relaxation. The bedrooms are cosy and inviting, decorated in romantic style. The attic features a dreamy bedrooms ideal for couples. This lovely villa is ideal for families that seek a quiet haven to enjoy their time away with their loved ones. Airport is a few km outside Argostoli. Daily flights except charter ones. 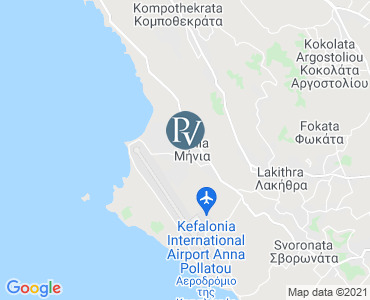 Also ferry connections with the neighbouring islands as well as mainland (Patras, Igoumenitsa and Kyllini) from Argostoli, Sami and Poros. During high season also ferry connections to Italy. The property is within walking distance to the sea, local shops and restaurants but since the island of Kefalonia is very big it is recommended that a car is rented. Map location is for the general region on the island - not the villa. All prices are per week for the villa only. Villas are booked from 16:00pm on your arrival day to 10:00am on your departure day. Please note that availability shown is subject to confirmation - please call our reservations team. The biggest island of the Ionian Sea is Cephalonia (Kefalonia) with a fascinating landscape that combines olive groves, mature forests, cliffs, arid scenery, high mountains, plus wild rivers - all along the most amazing coastline. Cephalonia has remained relatively unknown, until in recent years when it became known in the book by Louis de Bernieres' and then the subsequent film "Captain Corelli's Mandolin", which introduced the island to a worldwide audience. The most beautiful beach is Myrtis, where the long woft white sandy beach and pebbles hides in a rocky bay - it is a very popular place for its overwhelming beauty. The remainder of the island offers numerous pale golden beaches for those sunny summer days. All of the towns and villages across the island are picturesque and worth a visit. A must is to include the village of Fiskardo, a colourful seaside village with traditional houses, narrow pedestrian lanes and harbours where you can gaze at either the small fishing boats or luxurious yachts. Once you have visited Cephalonia you will plan to return. Cephalonia has an international airport with direct flights from most major cities. You can also get to the island by ferry from the nearby Ithaki or from Patras and Kyllini in Peloponnese. Ionian Islands (or Western Greek Islands) are a group of Greek Islands located along the west coast of mainland Greece in the Ionian Sea. These islands are traditionally known as the 'Seven Islands' referring principally to its bigger and better known islands but many other smaller ones are also part of these archipelago. The islands all have their distinct character and are famous for their many beautiful sandy beaches and lush green vegetation, which, unlike most of the other islands in Greece, covers them.